Let me just start by saying how completely amazing this book was!! I so LOVED reading this book! I even wanted to slow down and just savor it instead of devouring it, but in the end the need to know what happened won out. The writing was absolutely beautiful and I found myself getting lost in both present-day Sienna and the Sienna of the past. Seriously, old European cities are the best kind of setting for a book. Especially a city as romantic as Sienna. Or it sounded completely romantic in the book. I now feel a burning need to visit Italy (Sienna, Rome, Verona... ALL OF IT!). I have to admit I've never read Romeo and Juliet or seen the play, but I know the gist of the story, which was enough. I had however heard rumours before that maybe Shakespeare didn't write all of his work himself and this novel presents an interesting idea: what if the tragic story was based on actual events? And what if the real Romeo and Guillietta lived in Sienna? And what if their descendants to this day aren't freed of the curse? Gosh, it was just amazing! 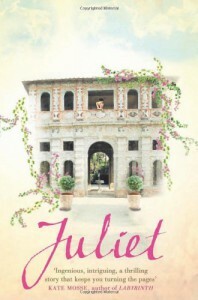 I loved Julie (or Guillietta), the main character, I felt I could really connect with her and to me that's SO important! I also really liked Alessandro, the mysterious guy with LOTS of secrets. So I guessed one big one pretty early on, there were still some others that I didn't expect. I loved the romance and the whole plot with incredible twists! This book was such a treat! And it was a story within a story, don't you just love those? And I now have a new holiday destination for next year!